This is a pamphlet for donations to be made for scholarships. It tells a true story about a girl named Leafy. Mrs. Evans (It's difficult to read her first name) donated one thousand dollars to the students in need. Keep in mind that where it says author, she did not write the article, but rather the check for the donation. 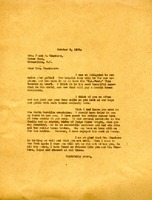 Martha Berry writes to Mrs. Chambers thanking her for her gift and saying she wished she had known Mrs. Chambers was in North Carolina during the summer so she could have tried to visit. She notes that she had been busy with accidents in the family that she has had to deal with over the past few months. She explains that her sister was in an automobile accident and broke 6 ribs and 2 collar bones. She says that she hopes she can visit Mr. and Mrs. Chambers the next time she's in New York. In this letter Miss Kate W Chambers writes to submit three scholarships, one for the orphan girl for $250 and two more for $200 each for the little orphan boys of Berry; She thanks Miss Berry for the cake she sent at Christmas and wishes her well. 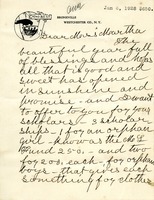 Miss Irene Bigelow have a scholarship in response to the appeal. Julia P. Smith desires to offer her help to two orphan girls. She asks Martha Berry how much it would cost for them to attend the Berry Schools for 12 months and if the price will be different if they are not from Georgia. Appeal tells the story of Nora a bright obdient orphan girl that was brought to The Berry Schools so she could have a chance in life. The recipent has sent $100 for the current expenses of the schools.